I’ve always considered Ramsons to be a bit of a ‘hidden gem’ although it really isn’t as it’s won countless awards. Just last year it was voted Restaurant of the Year in the 2012 Manchester Food & Drink Festival Awards as well as 43rd best restaurant in the country in The 2012 Good Food Guide who also gave their all Italian Wine list the accolade of Best Wine List. All thoroughly deserved and i’m very grateful to have such a great restaurant less than 10 miles away! Ramsons is in the small town of Ramsbottom, a borough of Bury situated in the West Pennines. It’s a picturesque country town and Ramsons is located on the main road in the centre. It’s a small place and doesn’t stand out from the shops around it, on my first visit I drove past it several times. Inside the decor is classic but very welcoming, the wine collection is proudly on show which is a great centre piece. We were seated by Chris Johnson the owner who has been running for Ramsons for almost as long as i’ve been alive! There are several menus including a 10 course Gourmet menu which I was very tempted by but in the end decided to go for the 6 course ‘Ramson Classics Menu’ which consists of 6 signature dishes that have been popular at the restaurant for over 27 years. We were first served an amuse bouche of spring vegetable broth which was tasty and light, a little uninspiring perhaps but a good enough way to start the meal. 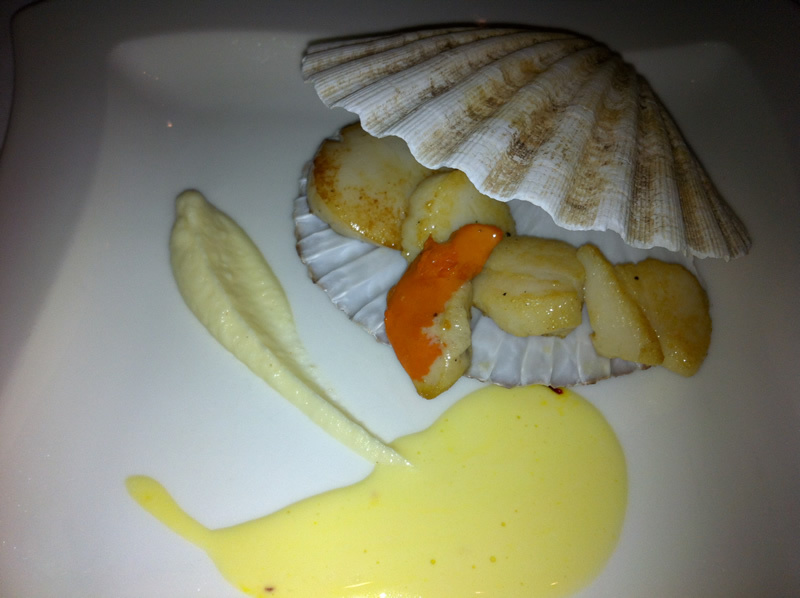 The first course was Seared Shetland Scallops with celeriac puree which arrived looking fantastic served in scallop shells which is always a winner in my book. They tasted as good as they looked too, the scallops were well cooked although personally I would have liked a bit more of a sear on the outsides but the insides were deliciously soft and moist as they should be. The puree was lovely and the flavours complimented the scallops perfectly. 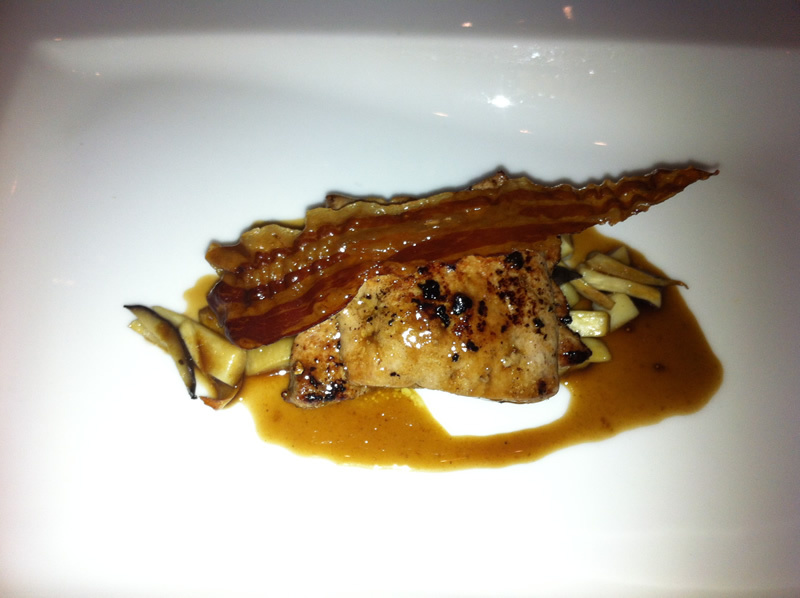 Next up was Sauteed Calves Liver with cardoncelli mushrooms and pancetta, i’m not a huge liver fan although I will eat it in good restaurants. This was by far the best liver I have ever tasted, I would probably never have picked this dish had it not been an inclusive menu but i’m so glad that I got to try it. The liver was cooked perfectly, juicy with just a little pink in the middle, the pancetta was smokey & crispy, the mushrooms added earthiness and the sauce brought the whole dish together. Just brilliant, a fairly simple dish with few ingredients but brilliant flavour combinations and top quality cooking. 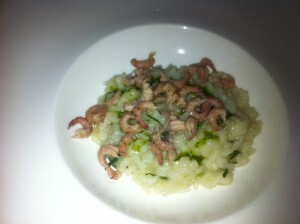 The Carnaroli Rice Risotto with brown shrimps and damsons infusion arrived next and was another example of flawless cooking. Beautifully seasoned, subtly flavoured, creamy, oozy & soft with delicious sweet shrimps. Risottos really don’t get much better than that. For the main course there was a choice between Flashed Filet Of Beef with potato fondant and pippin mushrooms or Pan Fried Fillet of Brill with creamy mash & saffron sauce. I went for the beef as filet is my favourite cut and I just knew it would be good. I was right, the filet was cooked to perfection. Nicely seared on the outside but perfectly soft and juicy on the inside, I love the fact that I wasn’t asked how I would like it cooked, rare is the only way a piece of meat of this quality should be. 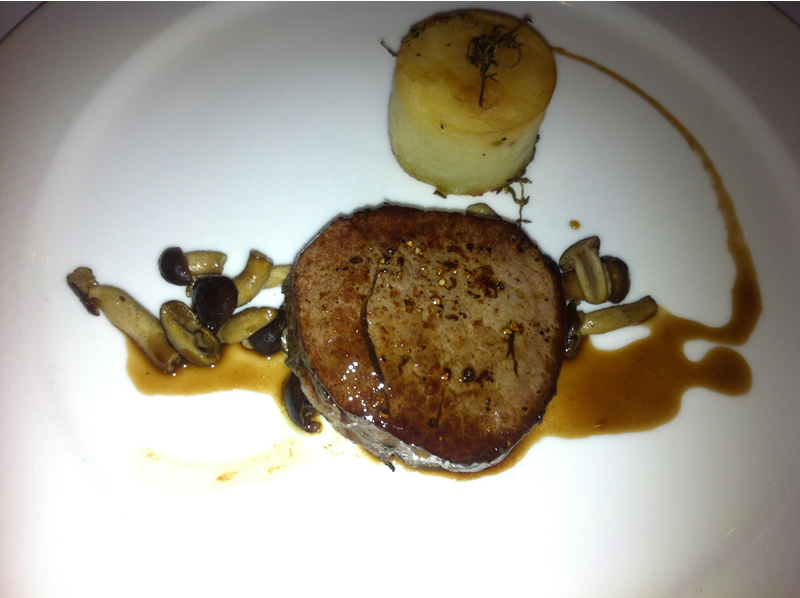 The mushrooms & sauce were great and worked well with the meat, my only complaint was the fondant potato which was only just cooked, it wasn’t raw but was a little too hard. Good fondant potatoes are crispy on the outside and soft inside, unfortunately this was neither. The cheese course consisted of Crabtree, a nice strong hard goats cheese and Stitchleton a classic blue cheese which apparantly isn’t allowed to be called Stilton as it is made with unpasteurised milk. The cheeses were served with a nice tomato chutney and water biscuits. Dessert was one of my favourites, Panna Cotta. A classic dish which is so often done wrong, not on this occasion. It was packed full of vanilla, the perfect consistency, soft and creamy with a great wobble and served with a simple raspberry sauce. A perfect end to a perfect meal. Chris is incredibly knowledgable about wine and as i’m not I asked him to select a couple of white and a couple of red wines to compliment the courses. He did a great job as they all worked brilliantly. The white was quite sweet which was perfect with the scallops & risotto whilst the red really complimented the beef and cheese. The Prosecco we started with was deliciously light. Service was attentive but we did wait a long time between courses and it took well over 3 hours to get our 6 courses which I felt was a bit much, i’ve had 10 and 14 courses in much less time. It helps that the food was so good and it was certainly worth the wait but some sort of acknowledgment would have been nice. I heard Chris apologising to several tables but for some reason he didn’t feel the need to apologise to us, even when I told him we didn’t have time to stay for coffee due to how late it was. It was a small downer on an otherwise brilliant night, I can’t praise the quality of food enough. Whilst there are places doing more exciting and innovative things with food I can’t think of many that do simple but classic cooking this well.